Om Sairam! Even if I want to, I can’t thank enough to Hetalji and of course Sai Baba, my parents, my family and Manisha Bishtji, Who have played a major role in my life towards spirituality. Baba, please help me pen down and I will try not to make any mistakes in narrating details as I would just be Your instrument! Sunday 25th June 2017, will always be a "Treasured Date" in my lifetime. That was the day when Baba finally gave me DIRECT orders for MAHAPARAYAN. You all (my Sai Family!) must be thinking and curious to know What is Mahaparayan but behold, you all will get all your answers by Guru Pournima. So please stay tuned with us this week for series of posts related to it, as Something very different is about to happen. It will not only change your life but it will also change other’s life through you. Thus "We Ourselves Will Grow As Well; As We Will Help Others Grow As Its Baba’s Blessings!" While penning down I understand that Baba’s intent behind turning color of eye balls from white to black and then moving them. Baba has actually met me before twice; believe me not in dreams but in reality! First time’s experience I have already posted before - Sai Baba’s Presence In My Marriage and the second time experience would be part of this GuruPoornima Celebrations. Both times when He met me, His eyes had a major impact on me, His eyes had a different spark which I cannot explain. So now when I was praying Him from almost 7 months to give me strength and confirmation to go ahead with Mahaparayan, this time He did not meet me in Body form but in my dreams and His ways are always unique and well thought by Him! To keep that flow and concrete my faith, He continued with the play of His eyes which were again glowing and sparkling in my dream. Coming back to my dream, I was overwhelmed seeing Baba’s idol with life in it and I immediately got down from my bed and came and sat down on the floor where the table was placed. Then suddenly I saw Baba in body form as though a wrestler sitting on the table wearing only underwear, with His one leg down, not very sure but mostly His right leg I feel. I touched His feet and said Him, “Baba we are so lucky that we have got You. Without You how we would have fared? You do so much for us which we can’t repay but still is there any way or anything that we can do for You?” He then blessed me and said Yes there is one thing and He got up and went to my dressing area and He drew something very fast with both the hands on mirror. I was equally excited and wondered to see what Baba had drawn and to my astonishment it was a monkey. Then I said to Baba that, “Do You mean Lord Hanuman by drawing this monkey? Yes Baba it’s Hanuman ji only”! And then I saw Lord Hanuman instead of a monkey. Although I did not see any Udi anywhere in dream, the picture that Baba drew clearly looked as if He drew it with Udi and I believe it was Udi only. I asked Baba, “What day is it? Tuesday?" To this what Baba exactly replied I don’t remember but I remember that He mentioned two words Bombay, Tuesday and may be something more. I again asked Him P-forms? I said, “But Baba it’s so difficult, would it be possible? Me Koshish Karungi (Still I will try) Me Meri Puri Koshish Karungi (I will try my best). He then was in off-white kafni and usual form with His head gear with both His palms raised upwards and sternly said, “Koshish Woshish Nahi Bolna” (Don’t say I will try). Then started assuming that Baba is wants to say that don’t say I will try, because saying this is itself an excuse of not doing it. Try means even if it doesn’t happen its OK. So then I said, “OK Baba. Me Mera Pura Dungi-Karungi (I will do it and give my 100%) but Me Pura Burden Apke Shoulders Pe Daal Dungi (but I will put the entire burden on Your shoulders). Then He smiled and again raising His hands said, “Ha Phir Thik Hai Baaki Me Sab Sambhal Lunga” (Now its fine and I will take care of everything). This was the exact word to word conversation that took place. I was very happy to hear it and felt Baba finally gave me orders for Mahaparayan. Then I was looking outside the window where I saw crowd and many people from Airtel company with red T-shirts. Not only this, there were different pictures of Baba on those red T-shirts. One of pictures was of Baba in His standing pose with index finger pointing towards the sky, on another Baba was cooking in the Hundi and many people around. I also saw lot many people lined up parallel to a rope and spread very far. All seemed to be worried and one amongst them was my distant uncle who has passed away few years back. While one side of the rope in open land was crowded with many people the other side had countable heads. I saw Airtel people wearing those T-shirts with Baba’s pictures on it. I also saw few papers on one of which was written Mother’s Credits, rest I am not able to recall. I don’t know what exactly Baba meant by few things in my dream like Hanuman, Udi on mirror, His walking towards the bathroom, Airtel people etc but while penning down following things are coming to my mind right now. By Hanuman He must have meant that He would provide all the strength required for accomplishing MAHAPARAYAN as I always feel that it’s not that easy. But if Baba is there with us nothing is Impossible. He drew Hanuman with Udi on the mirror. Mirror is a place where we see ourselves. So this Mahaparayan will change not only my life or our lives but with each other’s help it will bless us all and revolutionize us. Past few days I was wondering what Baba meant to say by Airtel. Now I feel He meant that through technology we can reach Baba’s world where He Himself was cooking in Hundi for His devotees instead of reaching the other side and going through cycles of birth and death. As for MAHAPARAYAN WhatsApp is going to be one of the most essential factors, so may be that was symbolised. With this I woke up and was totally moved. I saw the time and it was 4.59 a.m. I got down from my bed, put on the lights and moved through all places where Baba had been in my room and tried to feel Him. Then I sat in front of Baba’s eyes which I have in my room and was getting goose bumps, hair standing at ends not for few seconds but quite a long time. I was so happy, tears were rolling down my cheeks and kept saying Baba THANK YOU and LOVE YOU SO MUCH. I was speechless, although I had hardly slept for 4 hours, I couldn’t sleep and was feeling blessed, blissful and very energetic the whole day. 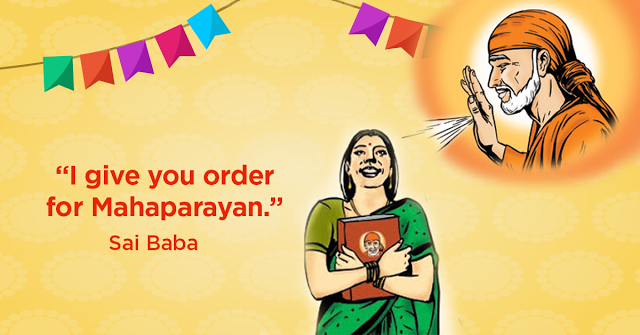 I had got what I wanted- the Direct orders for Mahaparayan as I had been asking Baba for the same since almost 7 months. Just as Hemadpant wanted the orders from Baba for writing Sai Satcharitra, I too was asking Him to instruct me past few months as the task of Mahaparayan seemed difficult to me and I felt I am not bold enough or capable to undertake the task which might expose me to ridicule. I even had said Baba that although Hemadpant was a great blessed soul, he too was waiting for Your orders to undertake Your task of writing Sai Satcharitra. So if You instructed Him, I too need to be instructed as I don’t even stand anywhere close to him. I also said that Baba as it’s said in Sai Satcharitra that You always encourage good thoughts, then why are You not encouraging this Mahaparayan thought? I also forgot to mention one thing, few days before (on 5th June screenshot attached), I had some dream related to Baba which I don’t remember now. What all I remember is that I asked in Prashnavali after waking up, the meaning of dream and it said Read Ram Vijay for 14 days, something very different is going to happen through you. 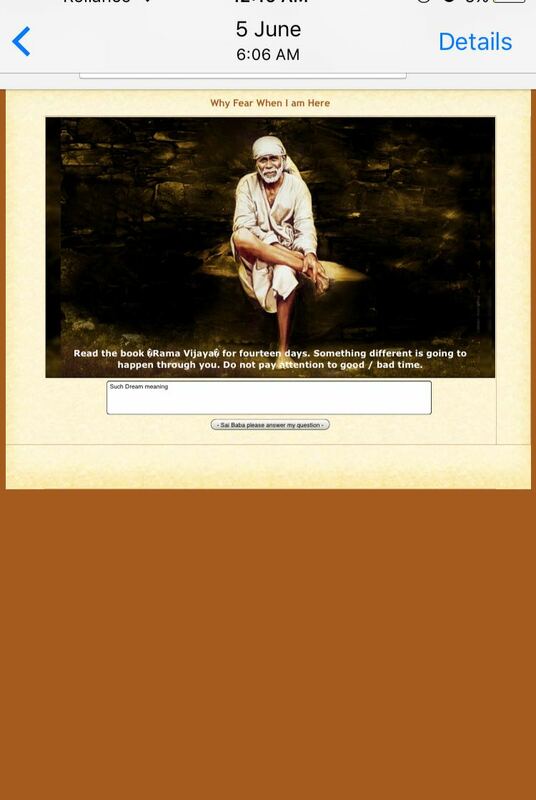 I did read Ram Vijay as told by Baba for 14 days. Later I fell very sick for almost 12 days and had totally given up the idea of Mahaparayan and thought that it would not be possible. Then on 22nd June 2017 Thursday, I said Baba that I have been waiting for Your orders and how much ever I try I am unable to proceed further with it. Unless You bless it, it’s not going to be possible. If before Guru Pournima which is on 9th July 2017 You instruct me and say that You will take care of everything, I will be encouraged for it, else I would completely remove the thought of Mahaparayan from my mind for ever. I had thought He would instruct me on the Guru Pournima day to test my patience and never thought that just after three days itself He would instruct! (25th June 2017, Sunday). Past so many months I had been asking Him, but now I understand as His ways are His ways and they are so beautiful! His timing is also perfect as He wanted to initiate it on the occasion of Guru Pournima and do it in the Centenary year of His Mahasamadhi, instead of past few months. I know You all must be curious to know all about MAHAPARAYAN for which you will have to stay tuned to the series of posts here all this week. Jai Sairam! Hi, Is the list of people selected for this Mahaparayan finalised? Kindly reply. How to join this ?? OM SAI RAM ! BLISSFUL !!! We are operators for Shirdi Tour from Bangalore by Flight. Our Flight Tour Packages from Bangalore departs every Friday. I want to be the part of Mahaparayan, Can anybody please tell me the procedure. Please help me Om Sai Ram. I would like to take pert on maha parayan . I have Sairam sitting here in front of me . He appeared in the jyothi when I did the Akanda jyothi for 48days. Through out he appeared and danced for aarthi. The idol of Sairam sleeps during the night. I am blessed by him. And continue to pray for his blessings. Om Sairam. I want to join this group or someone please suggest ways to get Baba s grace and get out of the trouble that Im undergoing now . Pranam Baba ji....Yes if He desired I will also have His blessings to be part of Mahaparayan. Can I please be a part of this Mahaparayana. I am a devotee from US. Please let me know how I can participate. I also wish to be a part of Maha Parayana dear Baba...please Baba..will u not admit me to your university. Can I be a part of mahaparayana now? SaiRam. can I be a part of this group. SaiRam, can I be a part of this group now. I want to b part of mahaprayan.Pls guide . Baba plz I want to join the mahaparayan.. .